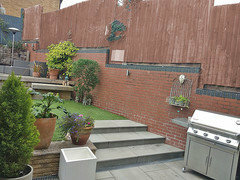 I need some advice please, I want to paint my ugly fence, it needs to compliment the red brick and the light grey stone patio. 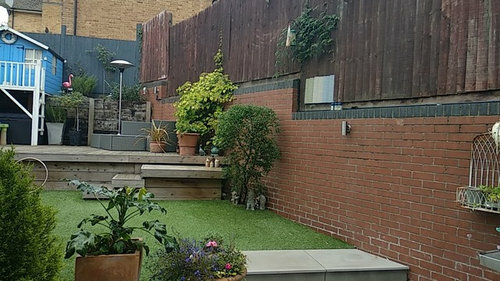 I'm wondering weather to stick with dark grey or to try lighter colours, it's a tall fence (up to 10' in places) so it's pretty imposing in my compact garden. 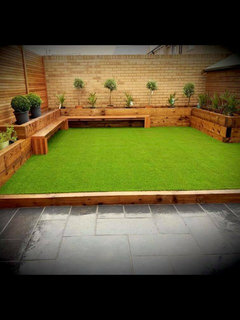 I like the colour of the back fence I think it will compliment your Garden. I would not go with contrast, I would paint the same color as brick. Here is my mock up, so you can see how it might look. I find that the dark grey (as per celerygirls illustration) compliments the garden nicely and coordinates well with the darker brick work as well as they grey patio/seating. Grey all the way. A nice dark grey rather than light. My brother painted his garden fence pale grey and it sticks out like a sore thumb. Dark colours recede and dark grey will be a lovely backdrop to the plants. Black is nice too. 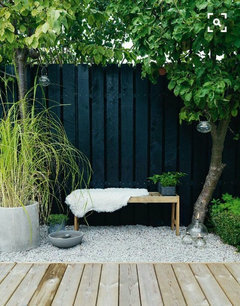 Go with a natural look it brighten up the fence. Kim, about your bamboo, can I ask you if you cut/pruned the lower parts to create the bare stems at the bottom or do they just grow like that? I like the effect. Ours are very bushy, top to bottom. it's pretty much grown like it, but I have removed some of the lower leaves. it's been in the same pot for about 18 years, want to repot it, but understand it's best done in spring. I've also recently been giving it tomato feed occasionally, that has really helped it bush out at the top and new stems grow. I agree with Lomuarredi, white could be good, but I wouldn't go for a brilliant white. This could look a little cheap. We've painted (or rather, stained) ours in Ronseal's Woodland colours White Ash. It's a white with a hint of grey. Although a little bit watery, it's really easy to apply. 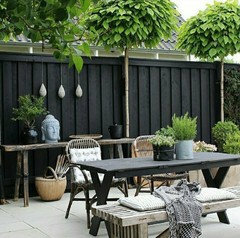 I think if you try to paint that particular fence a light colour it will show all the imperfections in not a good way. If it were mine I’d be going very dark and also breaking it up with some taller plants. I have just painted my fencing dark grey and it is fab, everyone that sees it, thinks it’s great, they are going to paint theirs!! All the plants show up brilliantly. Definitely go for it! Julijor do you have a photo of the colour please I am thinking of going grey too! 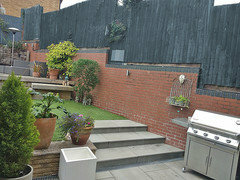 Make a feature of your fences with climbers. Thank you, great advice. 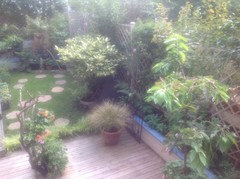 This is why I was worried about fence colour and didn't want it over bearing. I'm hoping to get lots of tall plants in pots, and hopefully a relatively slim, but big tree in a pot. 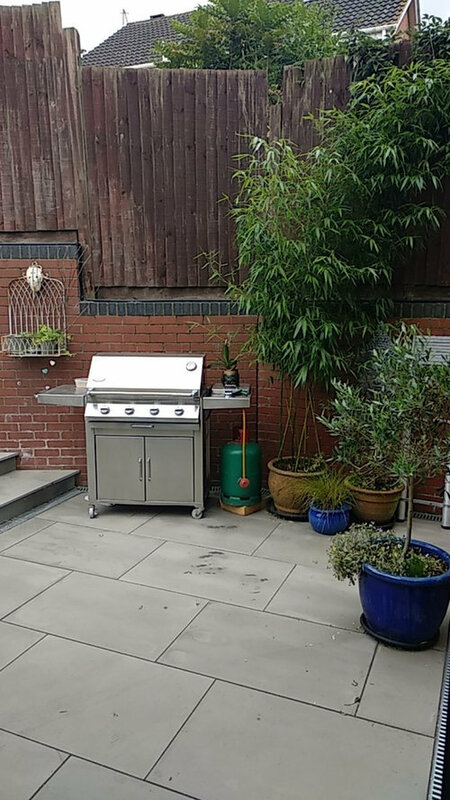 It's only a small garden, but would like a bit of a jungle feel on my patio to compensate. 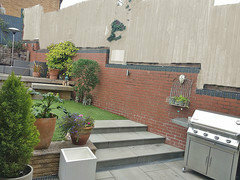 I'd go with the dark grey or even a black to tone in with the decorative bricks. We had similar problems when we moved here; a (neighbour's) ugly fence facing one of our bedroom windows, and two ugly low walls, topped with kitsch wrought-iron work. As we couldn't paint the fence, we screened it with black bamboo (phyllostachys nigra), grown in slender planters - we now observe lovely plants, and don't have to worry about painting - and repainting - a fence. We dealt with the walls in two ways: for one of them, we screened it with a European beech hedge (fagus sylvatica), and for the other, we grew star jasmine (tracholespermum jasminoides) on trellis. All three plants have proved hardy and quick growing; perhaps you'll find a use for them. Thanks for the tips and plant names Seneb. I used Ronseal medium oak and it’s really nice. I thought about grey but decided that during winter when the skies are grey are weather is horrible and days are dark that it would be a bit depressing. Personally I wouldn't go for the paint that's sold in those huge tubs. Its so thin, although cheaper especially at this time of year. If your budget allows, go for cuprinol or ronseal in the tins. (garden shades). It gives much better depth of colour. 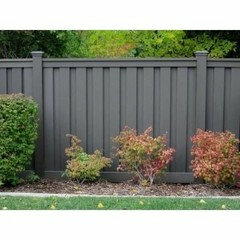 Seeing as your fence is already dark it should be easy to go dark grey. We have just switched from a horrible dark brown to a dark grey and very happy with the result. I would recommend for something different. Went for a willow green Cuprinol Shades, on my new fence and shed Summer last year and it's looking fresh still. All the plants especially reds and copper tones are picked out by it and it is nice to look at in the Winter too. But I am a fan of colour, dark grey looks good too, but I don't think I would like another layer of grey in Winter. Unless you have some contrasting winter foliage against it , maybe ? It looks like a sound fence but not a very smart one. I would paint it a mid grey and then fix fretwork panels in front of it, supported by fixing to the wall as well. Another good option might be a Photinia, which is evergreen, new leaves are red. I would go for the dark grey. Painted mine 'forest green' which was okay whilst plants were maturing and from a distance looked like a hedge. Will change to grey/black in the autumn. how easy is it to change a fence colour?